I came away knowing that this little island makes its own beer, but all I knew was its name: Illa. The internet seems almost oblivious to it, with only one or two Google searches returning anything. Luckily, Menorcans, whether it's just what they do or whether it's for the benefit of tourists, are good at promoting the things they make here. 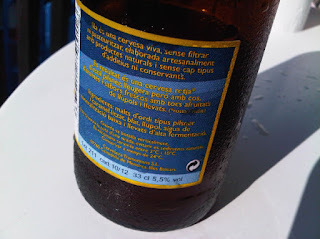 Walking into the first supermarket, I saw those blue and white bottles on the shelf (next to a sea of green and red cans of lager) above a sign which read 'Beer from Menorca'. Another sign I read a few days later explained that the beer is made from 'the unique challenge of grain grown on the island'. It's 5.5% and trying to translate the label I think it's unfiltered and unpasteurised. It certainly looks that way when you pour it out: it's an opaque, burnished gold. This is the first sign that this beer is not just a me-too continental lager that it could've so easily aped for the tourist market. This beer is different. It has a lemony, peppery aroma, it's dry and refreshing, the hops bringing a bite of bitterness and it finishes with dry, zesty lemon. 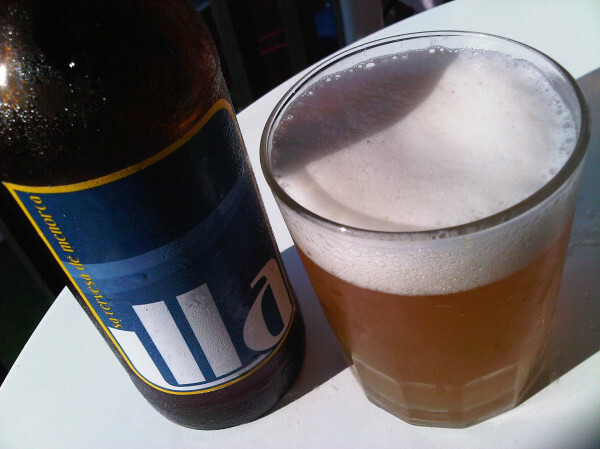 I like Illa a lot and for a holiday beer it stands above the usual hot-weather cold-lagers. I've drunk lots of bottles of it already and I'll drink more before I leave. The lemon-pepper bite reminds me a little of Orval, of brett, but it seems to be in all the bottles I've had, and anyway, it tastes good and it makes a great change from the Heineken-a-likes. It's also a great beer to go with fresh seafood and warm sunshine. Interesting find, buddy. Good work! What sort of a difference to the taste of a brew do things like temperature, bubliness (this sort of thing - http://www.wesureservegoodbeer.com/pouring_the_perfect_pint.cfm) make? In your opinion for example, does a Fosters that is a bit more gassy taste better or worse? Can things like this change your opinion of a pub, or is a Carling the same wherever you go? "Illa is a live beer, unfiltered and unpasteurised, craft brewed from natural ingredients without any kind of additive or preservative." "Craft brewed" is my translation of "elaborada artesanalment" - I never know quite what to do with words that literally translate as "artisanal", but "craft" is close enough.